Preheat oven to 350°F and grease the madeleine pans with butter. Coat pan well with rice flour and tap out, this is very important as it keeps them from sticking to the pan. Using an electric mixer on medium speed, beat the eggs, salt, granulated sugar, and 1/4 cup powdered sugar for about 5 minutes until thick and fluffy. Fold in the pistachios and rice flour until combined, then slowly add 2 tablespoons rosewater and melted butter being careful not to overmix. Fill molds in center with batter until 3/4 full, batter will spread while baking. Bake madeleines until edges are golden brown and centers are puffed and lightly spring back when gently pressed, 8−10 minutes. Let cool. Tap pan against counter to release madeleines. If they feel a little stuck, try loosening edges with a small spoon. Using a paper towel, place grated beet in center, fold up and wring the beet juice out into a small bowl. Place 1 cup powdered sugar into a separate bowl, whisk in 1 tablespoon rosewater and slowly add water by the tablespoon until the consistency is slightly runny. Add beet juice until you've reached the desired shade of pink. 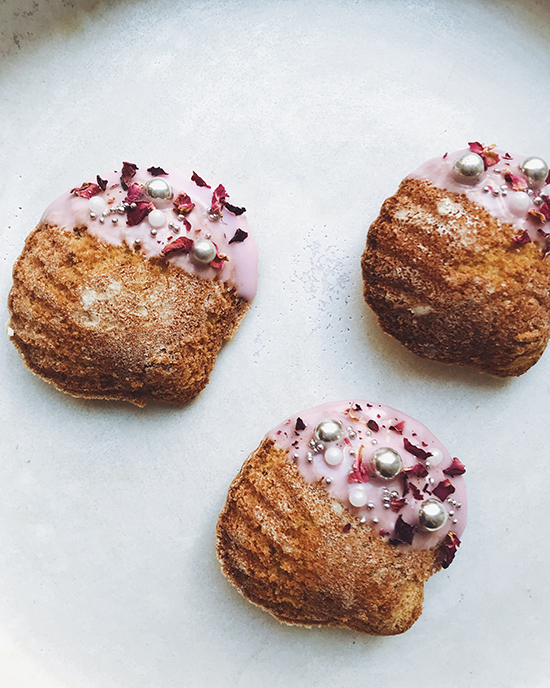 Dip the madeleines into the glaze and garnish with dried rose petals and dragees.